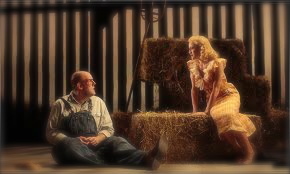 Lately I've been thinking a lot about the book Of Mice and Men, in particular of the character Lennie Small whose strength and size were not very small at all. My seven-year-old son Calvin is getting bigger and stronger, even for a little peanut who doesn’t yet register on the growth chart. Since he started a new antiepileptic drug a couple of months ago, and for some unknown reason, his poor muscle tone has improved. This growing boy of ours has always been very affectionate. He loves to be cuddled and he’s big on hugs. He’ll reach out with his little hands, puts his arms around my neck and knead my skin and, more often lately, pull locks of my hair. Sometimes he gets hold of my neck with such fervor that I feel he could, with a little effort, yank my tendons and jugular vein right out. “Be gentle,” I tell him, “be gentle.” Other times he’s boxed my ears or nearly whacked an eyeball out with an errant, though purely innocent, fist. I recall imagining Lennie Small, the simple-minded giant in John Steinbeck’s novel that I read so many long years ago. In my mind I can see Lenny in an old weathered barn, sitting on a bale of dry hay with the lass whose long shining hair beguiled him. So impassioned by the young damsel’s beautiful locks that he was caressing, unaware of his own strength, Lenny could not contain himself and, when she panicked, he got spooked and inadvertently snapped the fragile girl’s neck as she struggled to get away. I wonder if Calvin will continue to be oblivious to his own increasing strength because there's no doubt in my mind that he'll always love embracing. Perhaps one day I should consider chopping off my long auburn hair and opt for shaving my head bald, just to be safe.